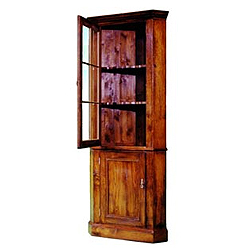 Your corner cabinets, bookcases, TV cabinets, Hi Fi cabinets and drinks cabinets are custom made, so please give us some overall dimensions, choice of wood, and any other specifications so we can quote for the piece of furniture to suit you. We usually have standard items on display in the showroom to help you with ideas. Bespoke linen presses are also popular, providing both hanging and drawer space. 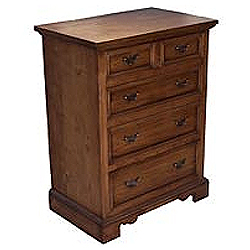 Chests of drawers are made to order, using solid wood, and dovetailed drawers. 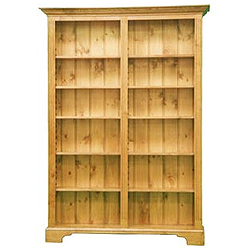 We are able to make bookcases to order, in a size and style to suit your requirements. Please state the overall size and shelf depth (determined by the width of your largest book). Shelves can be adjustable, or fixed, depending on your needs. We offer a range of television and hifi units, all of which are made to order. 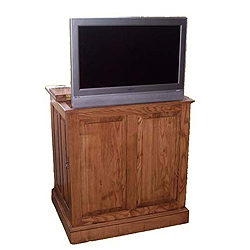 The traditional cabinet style is still popular but flat screen televisions have led to increased interest in the pop-up style units (as seen to the left). We require basic overall dimensions and, most importantly, details of the equipment you wish to fit within the cabinet/unit in order to provide a quotation. 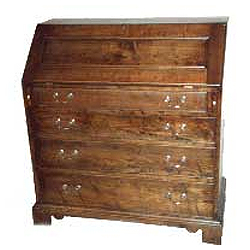 We will happily make you a bespoke desk or bureau, traditional or contemporary, to hide your filing and computer systems. These display cabinets are made to order. The top section can be glazed (as seen to the left) or kept open. The number and position of shelves can be altered as required.